Just in case you didn't find your Nintendo Labo set to be cute and colourful enough straight out of the box, this new Toad-based design could just be the great source of inspiration you need for a new build. Shared online by @NintenDaan and @japanese3ds, this video below shows off a Kinopio-kun version of the Nintendo Labo Vehicle Kit (for those not in the know, Kinopio-kun is a green-coloured Toad who acts as the mascot for Nintendo's official LINE social media account in Japan). This custom design replaces the Vehicle Kit's usual steering wheel setup with a fully functioning, drivable Toad. As you can imagine, words can't really do this justice, so check out the video below. We can't decide whether manually steering a Toad's head is adorable, or nightmare-inducingly creepy, but we're glad the thing exists all the same. The little taps on the head for the horn sound are a lovely little touch, too, and we swear he actually says the word "Labo" at the start of the video. Has he said this all along without us realising? While we may never know the answer to that one, we did stumble across this video below in an effort to find out. Being the lovely people that we are, we couldn't give up on the chance to let our lovely readers sit back and listen to this soothing music. Enjoy. 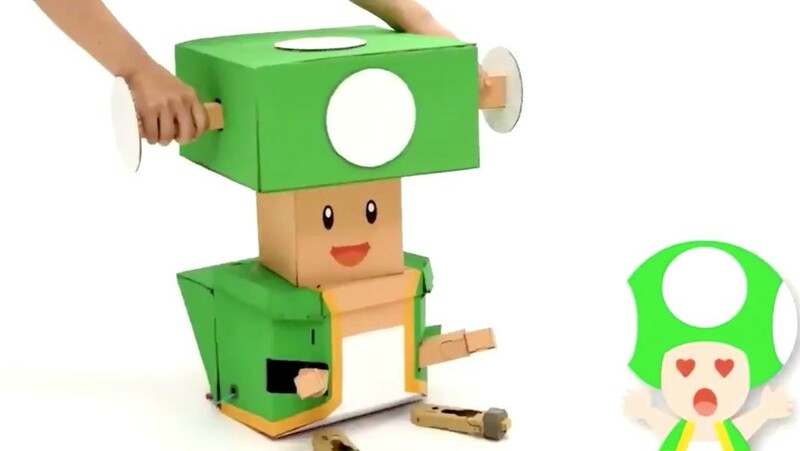 Okay, and where is the LABO Toadette Crown that needs to come with it? I need it for a... friend of mine? Don't get any ideas, guys. inb4 the internet invokes 34 and turns Creepy Cardboard Toad into a waifu. Oh...I'm too late. What did I just listen to for the last 2 minutes and 34 seconds of my life @ryancraddock ? That second video is more terrifying than anything else in this article..
Lemme guess, Bowsette is also being built as we speak? @NEStalgia 34 moves fast, we call it the "jump to waifu speed". I saw this on LINE this morning and it's a little creepy! @Matthew010 Nothing but sweet, sweet music. labo kits are stupid, stupid peripherals. no thanks. Super cute but its really just a steering wheel, so eh. Also, What is the game being played? Thats probably a stupid question but I honestly don't know. It doesnt look like mario cart and I cant think of any other driving game where it seems like Toad is driving around an open world? ...I'll go get the flamethrower. @NEStalgia I'm scared to ask but what is internet 34? I'm also scared that Toad will attack me in my sleep, his blank smile says he is thinking about it! @Arpie Google it urban dictionary will give you the quick and "dirty"
Outside of LINE, ‘Kinopio’ is also just the Japanese name for Toad in general (all Toads, as a species). I’m fairly sure it’s means to be a portmanteau of ‘kinoko’ (meaning mushroom) and ‘Pinocchio’, although I can’t find a reference stating that the similarities with ‘Pinicchio’ are deliberate. Captain Toad: Treasure Tracker is known as ‘Susume! Kinopio-Gunchō (進め! キノピオ隊長)’ in Japan (lit. ‘Advance! Commanding Officer/Captain/Squad Leader Kinopio). Hmmm reminds me of a certain Presidents body part. Or so I am told. @ouroborous it's third labo kit, vehicle set. "labo kits are stupid, stupid peripherals. no thanks." Your comment was so stupid to call LABO kits are stupid, you know. As for the first video: Lol, those cute Toad sounds! Cracked me up!